Head, Health Safety & Management of Nigerian Maritime Administration and Safety Agency (NIMASA), Fredrick Ugo; Director-General of NIMASA, Dakuku Peterside; Group Head, Private Banking, Private Wealth Mgt, Heritage Bank Plc, Victor Amakwe, and Chief Executive Officer, Occupational Health and Safety Managers, Ehi Iden, at the yearly Maritime Administration and Safety Enforce (MASE) HSE Workshop, in Lagos. Irked by the increasing spate of attack on the waters, the Nigerian Maritime Administration and Safety Agency (NIMASA), has assured seafarers and the international community of its unrelentless efforts to ensure safer for navigation on its territorial waters. Meanwhile, Heritage Bank Plc, and NIMASA have joined forces to educate stakeholders about the maritime enforcement global benchmarks. Director-General NIMASA, Dakuku Peterside, who made this assurance during an official visit of the Consular-General of the Korean Embassy in Nigeria, Kim In-Taek, said: “Nigeria is totally committed to the safety of all vessels that come on its coastal waters. Efforts have been doubled to ensure that vessels calling at Nigerian ports are safe and secure by investing even more in surveillance to guaranty safety of vessels. 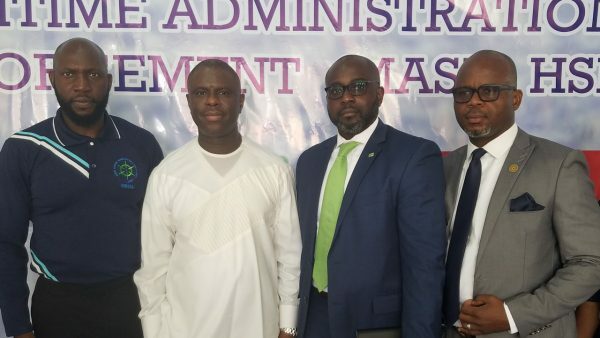 NIMASA is working closely with the Nigerian Navy and the National Intelligence Agency”. He noted that Nigeria was expected to witness a drastic drop in maritime crimes with the additional security measures being put in place by the agency, saying the country ultimately aims to completely rid its coastal waters of pirates and other criminals. On strengthening the relationship between Nigeria and Korea, Dakuku said Nigeria was taking steps to establish new synergies with other countries and further existing ones, such as its relations with Korea. He said Nigeria cherished its relationship with Korea and encouraged a mutually beneficial working relationship between both countries in ship building, shipping development as well as human capacity development and other aspects of the maritime industry. The Director-General was responding to concerns raised by the Consular-General about the recent hijack of MV. Glarus. It would be recalled that on September 23, pirates kidnapped 12 crew members from a Swiss cargo vessel in the Niger Delta region of Nigerian waters, taking away 12 of the 19 crew onboard the vessel. Massoel Shipping said that its vessel, MV Glarus, was carrying wheat from Nigeria’s capital to Port Harcourt when it was attacked. However, the training session, themed: Maritime Enforcement Safety: Current Global Benchmarks, had representatives from Nigerian Navy, Nigerian Ports Authority, Lagos State Safety Council, Shippers Council, Marine Insurers, Maritime & Dockworkers Safety Inspector and Marine Police. Group Head, Private Banking, Private Wealth Management, Heritage Bank, Victor Amakwe, said: “At Heritage Bank, we understand the importance of health safety, which implies that every working environment or workplace is kept in an organized, uncluttered, and hazard-free condition”. According to him, the benefits of doing this are far-reaching, and affect not only workers’ safety but also their health and productivity. “Improvements in worker health and productivity, in turn, lead to lower operating costs thereby providing benefits to both the workers and the employer”, he stated. Amakwe commended the NIMASA for its commitment to the enthronement of global best practices in the provision of maritime services in Nigeria, whilst ensuring effective maritime safety administration using modern tools that guarantee efficiency and effectiveness, towards developing indigenous capacity and tackling hindrances on our waterways. Previous: 3rd Quarter Rating: How Customs, NPA & NAMA Fared?